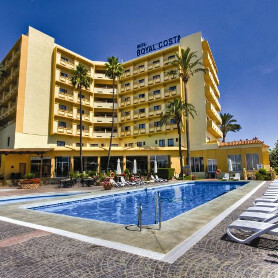 We stayed in the Royal Costa for a week, 19th -26th May 2013. I sent the hotel an email requesting a high floor with the sun shining on the balcony during the afternoon. What we got was a high floor with the sun in the morning only. However, it's worth mentioning that none of the views from any of the rooms are picturesque - you either look onto a block of flats, the pool, the railway line or villas. Some rooms have views of the sea in the distance. Rooms on one side of the hotel look onto the motorway, some waste land, the railway line, a view of the sea in the distance, the mountains and seeing the aeroplanes going in/out of Malaga airport. It sounds horrendous, but we were glad that we were on this side of the hotel, because given the choices it was more interesting than looking at a static block of flats, and it was quieter than the rooms overlooking the pool area. What little time we spent on our balcony we found that despite being so close to the airport, the railway line and the motorway, the noise wasn’t constant or annoying. I'd read a lot of reviews about the hotel, ranging from 'Don't go there, 'Keep away' to the other end of the spectrum of ' fantastic, can't wait to go back'. The good points of the hotel are, the hotel is spotlessly clean, cannot fault them on that score. It’s located near to train station (Malaga - Airport - Fuengirola line). Rooms on the smallish side - towels changed every day, bed changed once, but There was plenty of hot water, whatever time of day you had a shower/bath. Good sized safe, but expensive at 29 Euros for 7 days -10 euros back on return of key. Hotel has 6 floors and 2 small lifts - we never had to wait longer than 30 seconds for the lift, but it could be a problem in the high season. There is a good sized swimming pool - the shape to do proper swimming and a small children's pool. The bad points, based on H/B - the breakfast is adequate if you like cereals, toast/jam/marmalade, ham/ cheese and pastries. The evening meal was extremely poor - ok if you like salads, but everything that was cooked both for breakfast and dinner was luke warm. We never had a hot meal all week and after 2 days my husband gave up on the bacon, better stuff has been sewn on the bottom of his shoes. You could find something to eat, albeit salads and cereals/toast, but if we'd have paid any more for the hotel, I'd have been extremely annoyed because the 'hot' food was just yuk, it didn't even look appetising. The hotel is catering for International guests, but green peas and a cabbage concoction (swimming in grease) for breakfast would turn the best of International stomachs. We've stayed in 2 star rated hotels with better food. Reception staff helpful and pleasant when they were not hiding in the back. The bar/restaurant staff were rude and just uninterested - A couple of youngsters going through the motions with no idea how to clear a table or ask if you've finished. The hotel is situated in Los Alamos district of Torremolinos in a residential area with a supermarket, a couple of bars (one with Wi-Fi) and a pharmacy - all a few minutes’ walk away from the hotel on Avda Riviera. Torremolinos town centre is either a taxi, a train ride away or a very long walk. The beach is a 10 minute stroll away. The bathroom whilst it is clean and spacious, the bath has been installed in a bad position in an alcove, making it both dangerous for adults and difficult for parents bathing children. Entertainment is more or less none existent - just one hour at night playing quiz, bingo or the usual reptile show - we never stayed in once to see any of it. Bar prices for those not on AI - good lord they were expensive. If you're on A1, everything, and I mean everything, is served in a plastic glass/cup, even inside and nowhere near the pool. Flash your money and you'll get a proper glass. I found the Wi-Fi in the hotel tedious with a very weak signal - I had to keep going to the reception for the password - the longest password in history! We went to the bar outside and I had no problem accessing the internet with very reasonable priced drinks. We got what we paid for and used the hotel as a base whilst visiting other places and using the nearby rail network. I've given 2 keys for the location, simply because of the train station being a few minutes’ walk away from the hotel.